Eco-Schools is an international award programme that guides schools on their sustainable journey, providing a framework to help embed Eco principles into the heart of school life. Here in Northern Ireland, we have over 140 Green Flag Schools and are fast approaching 600 registered schools. Eco-Schools is administered in Northern Ireland by Tidy Northern Ireland. Children are the driving force behind Eco-Schools. 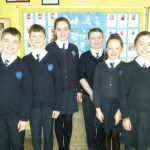 They lead the Eco-Committee and help carry out audits to assess the environmental performance of their school. Through consultation with the rest of the school, it is the pupils who decide which environmental themes they want to address and how they are going to do it. Green Team – Watch this space for our new Eco- Monitors and litter wardens. Words that we all know.